The Old Testament is filled with beautiful pieces of scripture that talk about love and are popular wedding readings. Readings from the Old Testament are an important part of Catholic and Episcopalian ceremonies and often used in other denominations. They are especially appropriate for Christian-Jewish interfaith marriages. 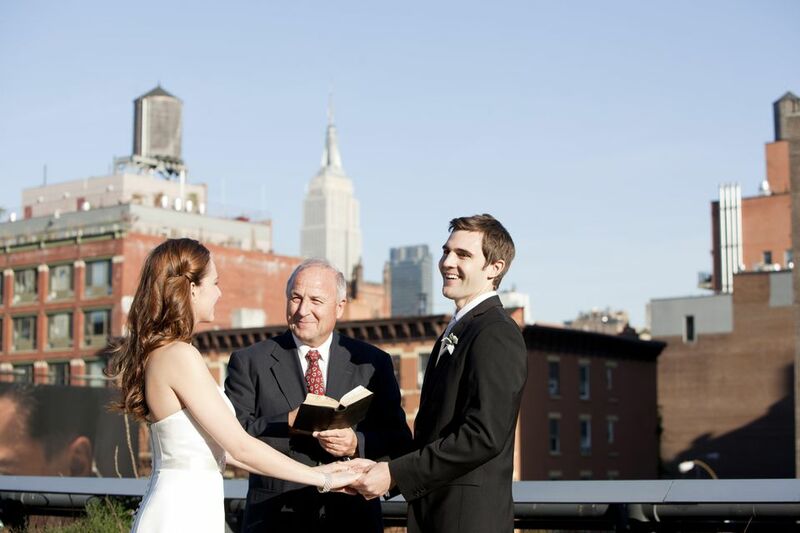 Your officiant can often help guide you to appropriate verses. Yet, you may still want to read and discuss all of these suggestions. Hopefully, you will find one that speaks to your relationship, views on marriage, or relationship to God. Your wedding day represents the start of your new family. You are making a commitment to your spouse, but also to fulfill God's command to continue the cycle of life by bringing children into the world. "God blessed them, and God said to them, 'Be fruitful and multiply, and fill the earth and subdue it; and have dominion over the fish of the sea and over the birds of the air and over every living thing that moves upon the earth.' God saw everything that he had made, and indeed, it was very good." Just like you may have searched for your new spouse, God searched for a suitable partner for man. A marriage really is a partnership, one in which you will be there for one another with all the love and support you have to give. "18 Then the Lord God said, 'It is not good that the man should be alone; I will make him a helper as his partner.'" "21 So the Lord God caused a deep sleep to fall upon the man, and he slept; then he took one of his ribs and closed up its place with flesh. 22 And the rib that the Lord God had taken from the man he made into a woman and brought her to the man. 23 Then the man said, 'This at last is bone of my bones and flesh of my flesh; this one shall be called Woman, for out of Man this one was taken.' 24 Therefore a man leaves his father and his mother and clings to his wife, and they become one flesh." The covenant that you make with one another today is an echo of the covenant that God made with everyone on Earth. Like the rainbow is a symbol of God's promise, your rings are symbols of your everlasting oath to love, honor, and cherish one another. "12 God said, 'This is the sign of the covenant that I make between me and you and every living creature that is with you, for all future generations: 13 I have set my bow in the clouds, and it shall be a sign of the covenant between me and the earth. 14 When I bring clouds over the earth and the bow is seen in the clouds, 15 I will remember my covenant that is between me and you and every living creature of all flesh; and the waters shall never again become a flood to destroy all flesh.'" If one of you has lost a parent, you might find this an especially appropriate wedding reading. Though Rebekah and Isaac have an arranged marriage, they find love in one another and Isaac finds the support he needed. "58 And they called Rebekah, and said to her, 'Will you go with this man?' She said, 'I will.'" "67 Then Isaac brought her into his mother Sarah's tent. He took Rebekah, and she became his wife; and he loved her. So Isaac was comforted after his mother's death." This may be a brief verse, but the sentiment comes across wonderfully. It is another way for a couple to signify that they are committed in their union to following God's teachings and passing that on to their children. "Now if you are unwilling to serve the Lord, choose this day whom you will serve, whether the gods your ancestors served in the region beyond the River or the gods of the Amorites in whose land you are living; but as for me and my household, we will serve the Lord." Though Ruth is talking to her mother-in-law, the commitment she makes is poignant. She is swearing her commitment to her husband's family the way that modern couples do to each other. You can take this as both an oath to each other and to the families that you are binding with your marriage. "16 But Ruth said, 'Do not press me to leave you or to turn back from following you! Where you go, I will go; where you lodge, I will lodge; your people shall be my people, and your God my God. 17 Where you die, I will die—there will I be buried. May the Lord do thus and so to me, and more as well, if even death parts me from you!'" A wedding is a transition between stages of life. It's a time when parents often give advice about what lies ahead. Though you are not children when you get married, it's a good time to be reminded of the need to trust in the Lord. "1 My child, do not forget my teaching, but let your heart keep my commandments; 2 for length of days and years of life, and abundant welfare they will give you. 3 Do not let loyalty and faithfulness forsake you; bind them round your neck, write them on the tablet of your heart. 4 So you will find favor and good repute in the sight of God and of people. 5 Trust in the Lord with all your heart, and do not rely on your own insight. 6 In all your ways acknowledge him, and he will make straight your paths." If you're looking for a simple and short verse about being a good wife, this is a nice passage. You could also expand it a few verses and include the portion where it goes into depth about a woman's relationship with the Lord and her community. You might want to pair this verse with the New Testament reading Ephesians 5:25-32, so there's one reading about the wife and one about the husband. "10 A capable wife who can find? She is far more precious than jewels. 11 The heart of her husband trusts in her, and he will have no lack of gain. 12 She does him good, and not harm, all the days of her life." A wedding is one of the most important events of your life. This verse acts as a reminder that these important events aren't random; God has a purpose behind each of them and ordains when they will happen and why. "1 For everything there is a season, and a time for every matter under heaven: 2 a time to be born, and a time to die; a time to plant, and a time to pluck up what is planted; 3 a time to kill, and a time to heal; a time to break down, and a time to build up; 4 a time to weep, and a time to laugh; a time to mourn, and a time to dance; 5 a time to throw away stones, and a time to gather stones together; a time to embrace, and a time to refrain from embracing; 6 a time to seek, and a time to lose; a time to keep, and a time to throw away; 7 a time to tear, and a time to sew; a time to keep silence, and a time to speak; 8 a time to love, and a time to hate; a time for war, and a time for peace." This verse is a reminder of why marriages are so valuable. Though it primarily talks about the strength of two being better than one, the last line speaks of three. The threefold cord is the bride, the groom, and God. "9 Two are better than one, because they have a good reward for their toil. 10 For if they fall, one will lift up the other; but woe to one who is alone and falls and does not have another to help. 11 Again, if two lie together, they keep warm; but how can one keep warm alone? 12 And though one might prevail against another, two will withstand one. A threefold cord is not quickly broken." Song of Solomon 2:10-13: Arise, My Love, My Fair One, and Come Away. Song of Solomon (aka Song of Songs) is an unusual book in the Bible. It's a love story between a man and a woman and doesn't contain explicitly religious content. Though some religious scholars posit that the book is a metaphor for the love between God and His people, it can also be read simply as a pretty love story. That makes it a good choice for interfaith couples, as well as those who may not be as religious as their parents. "10 My beloved speaks and says to me: 'Arise, my love, my fair one, and come away; 11 for now the winter is past, the rain is over and gone. 12 flowers appear on the earth; the time of singing has come, and the voice of the turtledove is heard in our land. 13 The fig tree puts forth its figs, and the vines are in blossom; they give forth fragrance. Arise, my love, my fair one, and come away.'" Another beautiful verse from Song of Solomon, this is a devotion from the Shulamite to her beloved. The words are filled with passion and devotion and would be a lovely addition to any matrimonial ceremony. "6 Set me as a seal upon your heart, as a seal upon your arm; for love is strong as death, passion fierce as the grave. Its flashes are flashes of fire, a raging flame. 7 Many waters cannot quench love, neither can floods drown it. If one offered for love all the wealth of his house, it would be utterly scorned." A single verse from Isaiah offers a simple suggestion that your love for each other should provide shelter and protection from struggles. Together, the two of you can weather any storm that comes your way. If you include verses 16-18 from this same chapter, you'll find the reminder that your love is a gift from God. "Each will be like a hiding place from the wind, a cover from the tempest, like streams of water in a dry place, like the shade of a great rock in a weary land." This is another beautiful passage about God's commitment to man, which you can emulate in the commitment you make to one another as you build a life together. Though you don't know what your marriage will bring, you can reflect on the fact that God will be with you through all of it. "10 For the mountains may depart and the hills be removed, but my steadfast love shall not depart from you, and my covenant of peace shall not be removed, says the Lord, who has compassion on you." "14 In righteousness you shall be established; you shall be far from oppression, for you shall not fear; and from terror, for it shall not come near you." In a modern wedding, emphasis is put on appearances and other superficial aspects. This verse serves as a good reminder that they are only symbols of what's really important. Your commitment before God and loved ones should be the focus of the day. Everything else is secondary, even if things don't go perfectly as planned. "10 I will greatly rejoice in the Lord, my whole being shall exult in my God; for he has clothed me with the garments of salvation, he has covered me with the robe of righteousness, as a bridegroom decks himself with a garland, and as a bride adorns herself with her jewels. 11 For as the earth brings forth its shoots,and as a garden causes what is sown in it to spring up, so the Lord God will cause righteousness and praise to spring up before all the nations." A marriage is a divine thing and a cause for much joy. That elation is the subject of these verses, where the rebuilding of Jerusalem is discussed after the coming of the Messiah. Its point is that, even before that time, the happy marriage you are creating is a sign of God's presence. "11 the voice of gladness, the voice of the bridegroom and the voice of the bride, the voices of those who sing, as they bring thank-offerings to the house of the Lord: 'Give thanks to the Lord of hosts, for the Lord is good,for his steadfast love endures for ever!' For I will restore the fortunes of the land as at first, says the Lord." In this book, God makes Hosea marry a harlot, as a symbol of Israel's unfaithfulness. Hosea's wife is unfaithful, and rather than have her stoned, God commands Hosea to go back to her and love her. God does the same with those that have forsaken Him. This verse is a beautiful love song, a reminder of God's steadfast love that can be emulated in a marriage. "16 On that day, says the Lord, you will call me, 'My husband,' and no longer will you call me, 'My Baal' [Master]." "19 And I will take you for my wife forever; I will take you for my wife in righteousness and in justice, in steadfast love, and in mercy. 20 I will take you for my wife in faithfulness; and you shall know the Lord." Tobit is a little-known book of the Deuterocanon—Old Testament books that are not part of the Hebrew Bible. It is found in the Catholic and Orthodox biblical canon but is not accepted by most Protestants. It tells the story of Tobit, an Israelite who devoted his life to doing good, but then is exiled, loses his fortune, and is blinded by a bird. His wife yells at him and he prays to die. Meanwhile, his relative's daughter Sarah is also suffering. She's been married seven times before and each of her seven previous husbands was killed by a jealous demon on their wedding night. God hears both Tobit's and Sarah's prayers and sends an angel to help them. He tells Tobit's son, Tobias, that he has the right to marry Sarah, and shows him how to cure his father of blindness, and Sarah of her demons. This wedding reading tells the story of their wedding night. "4 Tobias got out of bed and said to Sarah, 'Sister, get up, and let us pray and implore our Lord that he grant us mercy and safety.' So she got up, and they began to pray and implore that they might be kept safe." "7 I now am taking this kinswoman of mine, not because of lust, but with sincerity. Grant that she and I may find mercy and that we may grow old together." Sirach is also a book of the Catholic and Orthodox biblical canon and not accepted by most Protestants. This passage might elicit a few laughs from your audience, as it's slightly strange to give advice to just one member of a couple. But, it is still an uplifting message about taking pride in each other. Verses 13-16 from this same chapter are often included in this reading as well. That section talks more about a "silent" wife's self-discipline. Because of that, it may seem a little old-fashioned for many modern marriages in which husband and wife are considered equals. "1 Happy is the husband of a good wife; the number of his days will be doubled. 2 A loyal wife brings joy to her husband, and he will complete his years in peace. 3 A good wife is a great blessing; she will be granted among the blessings of the man who fears the Lord. 4 Whether rich or poor, his heart is content, and at all times his face is cheerful."